I am very sorry to report that I have found possibly the best thing I’ve ever eaten. It sounds so unassuming: The Mug Brownie. 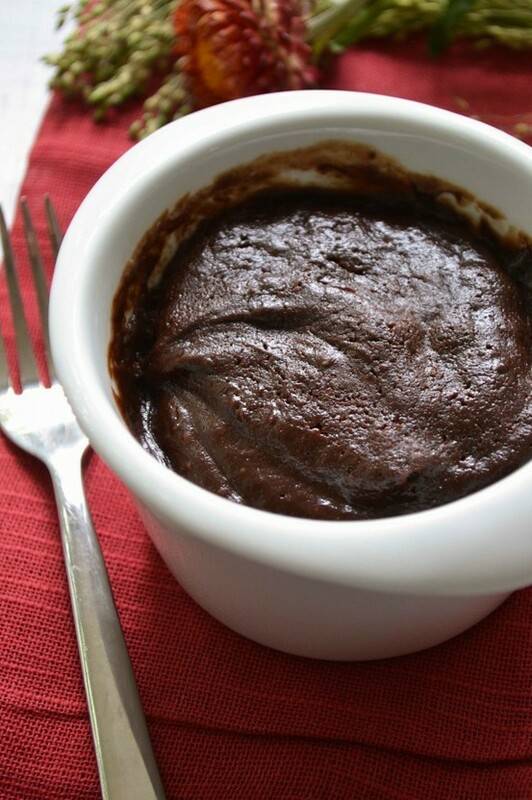 Yes, it’s like making a chocolate cake in mug in the microwave like you’ve heard of before. But what a difference. If you want to satisfy a chocolate craving so well that you won’t be craving chocolate again for at least a week, here it is. It doesn’t look like much, but it is much better than a straight chocolate bar, even the really good ones. I think part of the reason this little piece of heaven was so wonderful was the kind of cocoa I used. It’s called Dagoba cocoa (no affiliation) and I can’t help but think it sounds like a location in a Star Wars movie. I received some as a gift from my dear daughter-in-law (who knows me very well). We share a love for deep, deep chocolate flavor with not too much sweetness. If you love dark chocolate, I suggest you try Dagoba. The label says “unsweetened cacao powder with bits of unsweetened chocolate.” Hmmm . . . I suspect it’s those bits of chocolate that has made this dessert so amazing. The brownie recipe makes about half a mug full, and could be shared by two people if you just want a little bit. Since Paula Deen just came out about her diabetes with plenty of protestations that she always said to eat her recipes “in moderation,” I feel I must also make that disclaimer. If you only have this dessert once a week, it’s not that bad. My wise mother-in-law who has to watch her sugar intake, employs that trick. Once a week, Sunday for her, she has a nice sweet dessert. She enjoys it totally and doesn’t feel so deprived. She looks forward to it during the week and feels it helps keep her on track during the week. That sounds sensible to me, and this brownie dessert is satisfying enough to work. So it could actually help your diet. 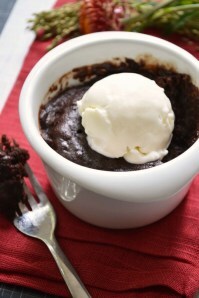 If you are entertaining you can add a scoop of vanilla ice cream to each mugful of brownie dessert. No one will complain. The brownie stays hot/warm for quite a while, so wait a little bit before adding ice cream unless you want it to immediately melt. By the way, eating this with a spoon works much better than a fork. I don’t know why they show a fork with this. If you want to be more fancy you can serve these in ramekins. If you don’t have enough coffee cups/mugs for a party, you can pick up as many as you need at a resale shop like GoodWill or the dollar store for about a dollar a piece. The recipe for one mug brownie is simple enough. If you want to make up a bunch of these, measure out the dry ingredients into each mug ahead of time, assembly line style. Then you can easily add the oil and liquid at the last minute and microwave individually. I wouldn’t put more than one in the microwave at a time because you could get uneven results. In a microwave-safe coffee cup stir the dry ingredients. Stir in the oil and milk until all the dry ingredients have been worked in. Microwave on high for 30 seconds. Check it for doneness – it will be done when it’s springy on top but still a bit gooey. I had to microwave it another 20 seconds, but you might have to microwave it an additional 10 seconds if you microwave is not that powerful. My microwave is on the powerful side if that helps. It will stay hot for several minutes, you want to serve it when it’s warm, not hot. I will experiment with the various combinations of milk, coffee, and water in this recipe and report back. It’s important work, and somebody has to do it. Kristy the biscotti recipe is actually called Brownie Biscotti and the link I added works. These biscotti make good gifts too! Hi Kristy! You may be right! The mug brownie is about the size of 3 brownies so that makes sense. Perhaps it would be better to share? I have it only once or twice a year as a special treat. Thanks for your comment and I look forward to seeing you around the blog! Just so you know – this is over 570 calories! & alot of that is fat. I think a regular brownie is around 150, you’d be better off having 2 or 3 than eating this calorie overload. I try to eat this amount or less for dinner! I’m glad you tried it! Yes, it is a bit rich. Since it’s just one cup, I know I won’t eat too much! I tried but made it in a soup mug. I added an extra tablespoon of water because it seemed too dry without it. I got a crumbly, warm chocolately dessert. Was good with whipped cream. A bit rich – be warned. Elaine, I know I have some followers in the UK; thanks for your kind words. Your encouragement is very much appreciated. I will have to see about the Green and Blacks brand of cocoa if I ever get to Britain. Funny about the toddler! For your UK Fans – you do have them you know LOL. I can confirm these are pretty darn yummy with “Green and Blacks” cocoa powder too. So next article please – how to prise said mug from hands of toddler? I know! Miss T., try to find the Dagoba cocoa to get that deep chocolate flavor. What a treat. I have seen so many recipes for these things and I have yet to try them. I have to get to it one of these days. They look awesome.